How to Play the Balalaika. 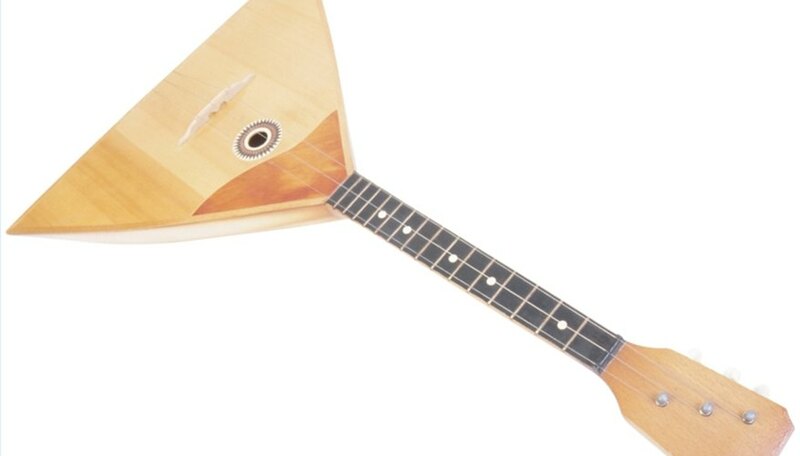 The balalaika is a triangular-shaped string instrument, popular in Russian folk music. The musical tones embody the character of Russian people with their ease in changing from happy to sad. Peasants poked fun at authority with songs written for the balalaika, so the instrument was even banned for a time in history. Try your hand at the balalaika and get a feel for Russian music of the past. Sit in a chair to play the balalaika. Use the thumb and index finger of your left hand to hold the instrument. Hold the balalaika close to your chest with the body of the instrument resting under your right arm and the corner between your knees. Strum high on the soundboard near the neck. Relax the hand, wrist and forearm, and strum from the elbow, using the edge of your thumb or tip of your index finger. Use a finger technique similar to playing a violin with the left hand. Listen and learn well-loved Russian folk songs at the Balalaika School on the Kaikracht website, including "Evening Bells," "Along the Petersburg Road" and "Cossack Lullaby." You can print out an entire tutorial at this site and learn some common Russian phrases. Do not strum over the center of the balalaika's soundboard as you would with a guitar, as the soundboard is made of soft wood and can be damaged easily.